Product #20530 | SKU GPR-9 | 0.0 (no ratings yet) Thanks for your rating! Get closer to the action and capture unique angles of yourself with the GoPole Reach 14-40" Extension Pole for GoPro HERO Cameras . 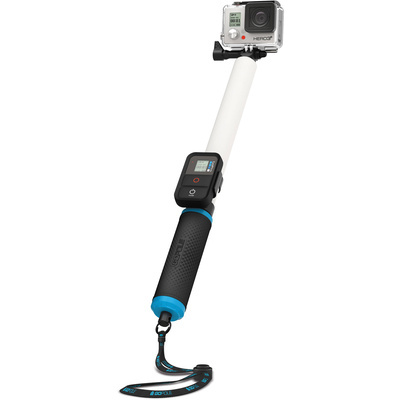 It features a three-prong GoPro mount and a four-stage telescopic design that extends from 35.6 to 101.6 cm, with a quarter-turn locking each stage in place. A durable rubber grip provides a comfortable, non-slip surface for holding the pole. A removable remote clip comes included for attaching an optional GoPro Wi-Fi Remote, putting camera controls at your fingertips while the camera is extended on the pole. Also included are a Hi-Torque thumbscrew and a wrist strap. 4-Stage telescoping design extends from 14 to 40"